IT SHOULD YEARS BEFORE THEIR TIME, CHARLES Fraser and Ian McHarg, raised the bar on environmentally sensitive development with construction on Amelia Island in 1971. Fraser, of the Sea Pines Company of Hilton Head Island, and McHarg, of Wallace, McHarg, Roberts and Todd, set out to find the optimum fit between man-s habitat and the natural environment. The man they chose to oversee their mission at their Florida island paradise was Frank W. Brumley. To say Amelia Island-s first general manager took to environmentally-sensitive development like a fish takes to unpolluted water is an understatement. In fact, Brumley-s career has taken him to several of the southeast-s most prestigious and progressive developments. 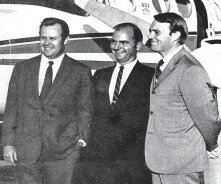 In 1974, Brumley moved to Charleston, S.C. where he became involved in the development of both Kiawah Island and Wild Dunes. Today he is president of The Brumley Company, a full-service commercial real estate management/development/ brokerage company; and serves as chief executive officer of the Daniel Island Company. This island town within the city limits of Charleston has been well underway for the last 10 years and currently has about 5,000 residences, plus a private golf club featuring 18 holes designed by Tom Fazio and another by Rees Jones. This community currently hosts more than one million square feet of commercial and retail space plus the 10,000 seat Family Circle Cup stadium and the 5,000 seat Battery Soccer stadium. Brumley-s contributions to both the Charleston community and to the field of development are numerous. Brumley currently serves on the board of directors of Synovus Financial, National Bank of South Carolina and the Lowcountry Open Land Trust. He is also vice president of the Charleston Civic Design Center and serves on the board of overseers for Terry Business College at the University of Georgia.